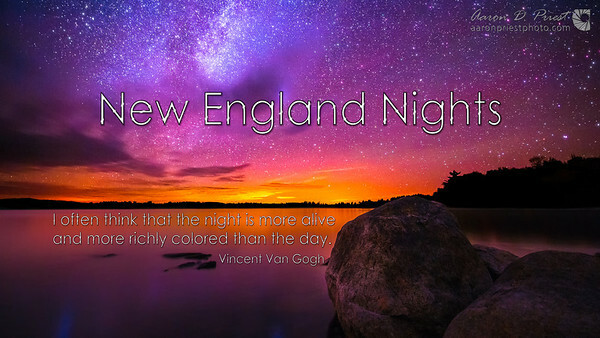 This is a compilation of panoramas, timelapses, and still photos that I have taken of the night sky in Maine and New Hampshire over the past couple of years. Special thanks to the folks at Promote Control, Panoneed, Really Right Stuff, and LRTimelapse for a lot of help and often custom hardware/software to pull off some of the shots! Major shout out to fellow noctographers who I hung out with shooting the night sky for hours on end in every type of temperature and weather to capture the images in this video—Mike Taylor, Christopher Georgia, Garrett Evans, Jared Blash, Josh Blash, Jon Secord, Matthew Parks, and Hali Sowle.